The microbiome is the collection of microorganisms living in and on an organism, such as a human or mouse. Interest in the microbiome is increasing due to a clearer understanding of the its impact on a number of different physiological systems, as well as the realization that microbial communities can vary widely from person-to-person. Aleksandar D. Kostic et al. Genes Dev. 2013; 27:701-718. 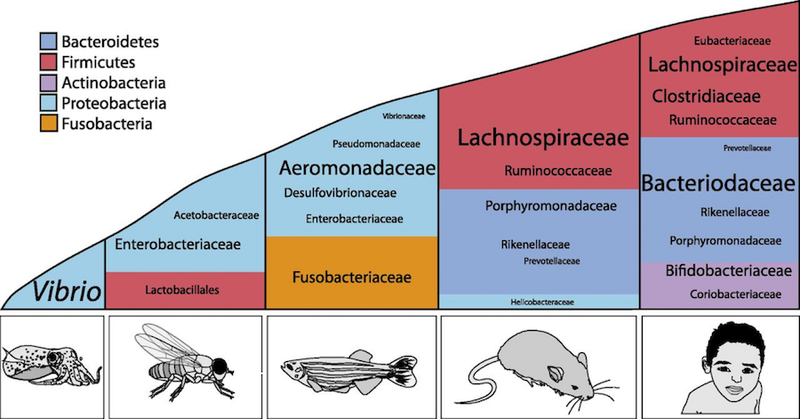 Although there can be significant inter-individual variation in the composition of the microbiota, broad trends exist within a given species, particularly at the phylum level. Here, phyla are represented by color, and the relative abundance of the lower taxonomic levels is indicated by font size. While each of us has a unique microbiota, it always fulfills the same physiological functions with direct impact on our health. 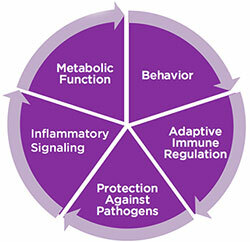 Disturbances in the microbiome have been noted in many disease states. Is this correlation or causation? 30-100 trillion beneficial microorganisms populate the human body. There may be up to ten times as many microbiome organisms as there are human cells in a person. 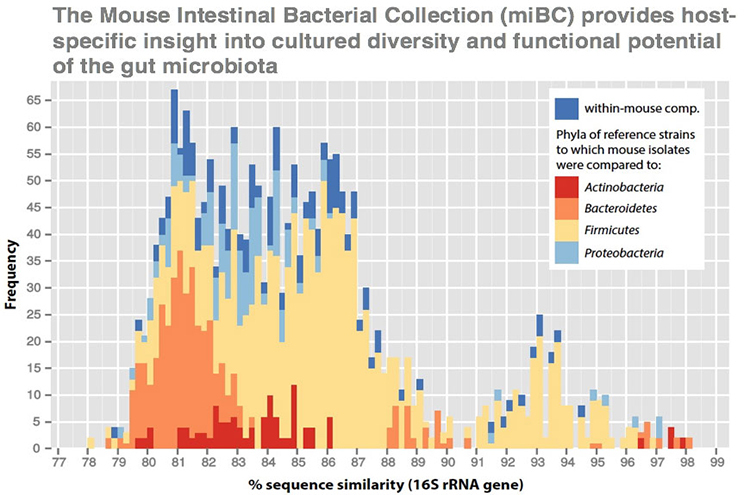 There are over 100 times more microbial genes in our gut microbiota than genes in the human genome. 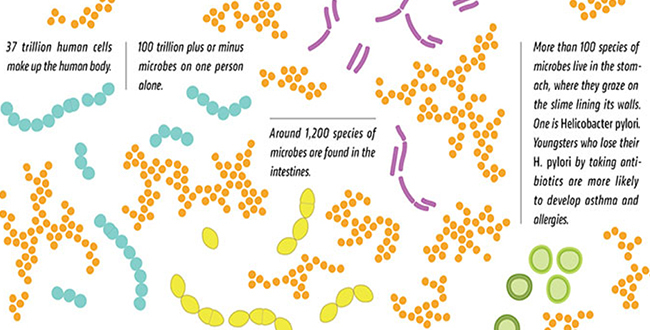 Over 10,000 different microbial species have been identified living in the human body. More than 1,000 different known bacterial species can be found in human gut microbiota, though only about 200 species of microbes are found in the average person. It is reported that while about one-third of our gut microbiota is common to most people, the remaining 2/3 are specific to each one of us. The laboratory mouse has long been a useful tool for in vivo studies, as it is easy to manipulate their genetics, health and microbiome. But with trillions of microbes in the human gut, and variation from individual to individual, how can mouse microbiome studies provide useful data that translates to human studies? Microbiome researchers may finally have the tools to address such foundational questions. Scientists at the Technical University of Munich published a study that established the Mouse Intestinal Bacterial Collection (miBC) and made it available to the scientific community. The study looked at mice on both chow and high fat diets in a variety of facilities. This study provided reference data for future studies and will support future research on microbiota-host interactions in health and disease, as it will facilitate targeted colonization and molecular studies. This groundbreaking work is essential for researchers looking at the interplay of microbiota and disease, and developing therapies that manipulate the human microbiome. Studies using mice to model the microbiome often take one of two approaches: starting from germ-free stock which are free of all organisms (except the mouse itself), and antibiotic treatment to knock down the microbiome. ← Do Some IBD Treatments Work by Altering the Gut Microbiota?